These vendors will continue to leave/pick up rental scooters with Disney resorts’ Bell Services. 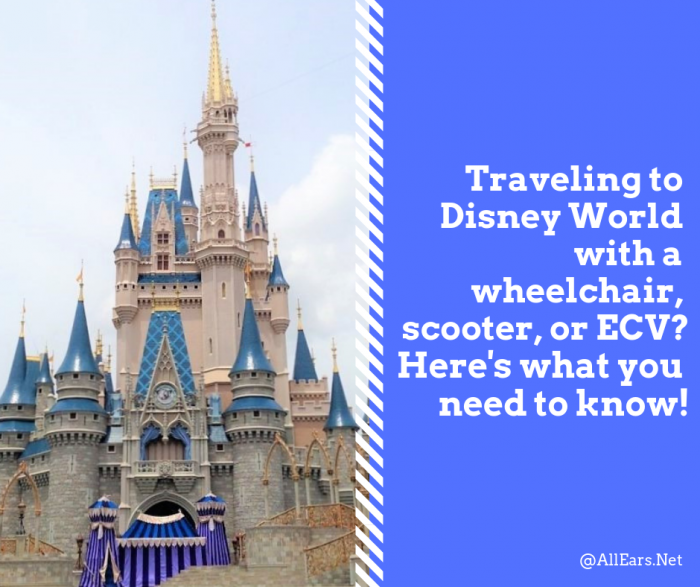 If you plan to use a wheelchair or Electric Convenience Vehicle (ECV) at Walt Disney World, there are several options that you can consider. 1) You can bring your own wheelchair/ECV to WDW as long as it falls within the 32″ x 52″ maximum size for use on the Disney Transportation System. All Theme Parks, Entertainment Areas, Shopping Areas and Resorts have wheelchair/ECV accessibility. 2) You can rent wheelchairs/ECVs from Disney at any of the four theme parks or at Disney Springs. Wheelchairs/ECVs are available on a first-come, first-served basis. Supply can be limited and NO RESERVATIONS ARE ACCEPTED. You must be 18 years of age to rent ECVs. 3) Your third option is to rent a wheelchair or ECV from one of the numerous outside vendors that service WDW on a daily basis. All these vendors provide delivery and pickup at your resort hotel free of charge. Make arrangements with the vendor directly as to which resort you are staying at and your desired delivery/pick up dates and times. NOTE: Disney will no longer provide storage for ECV/Wheelchairs except for its featured vendors. All vendors have support staff and can be contacted if there is any type of problem with your wheelchair or scooter. This allows you use of a wheelchair or ECV 24/7 while you are at WDW. Contact your vendor of choice for specifics. TIP: Buena Vista Scooters (AllEars.Net Sponsor) is located in front of the BoardWalk Inn and Villas. – You can have the scooter anywhere you go; minor parks, off-site, at the resorts, etc. – The scooter is available whenever you need it, not just during park hours. – You are assured of having wheels even when the parks have run out. – You can get a vehicle that meets your specific needs (one that will disassemble to fit in a car trunk, or one that will accommodate a heavy person for example). Disney parks scooters are “One Size Fits All”. – Variable speeds – Disney scooters are set at “slow”. – You must transport the scooter. That can mean waiting for a WDW van or accessible bus, dealing with ramps to the monorails and boats, or getting the scooter into and out of your own car/van under your own power. – Rental scooters are like rental cars. They are most often driven by people who are unfamiliar with them, and they get a lot of rough usage. They can have mechanical problems. ECV SAFETY TIPS: All ECVs have a speed dial. Please position it at a slow speed when boarding or exiting any type of WDW transportation. If you have a fear of driving your ECV on to or off of any WDW transportation, ALL types of ECVs have a safety neutral lever located under the seat that enables the drive wheels to be disconnected. This enables the Scooter to be manually pushed and maneuvered. The important thing to consider with ECVs is to PRACTICE driving them as much as you can if you are unfamiliar. They are only motorized chairs and not race cars. You can injure yourself or others if you are not careful. Most but not all offer FREE insurance against damage. There is no coverage for theft, so it is important to remove the ECV key when you get off your scooter. Where can I rent an ECV or wheelchair at Walt Disney World? Disney ECVs have a weight limit of 450 pounds. Disney wheelchairs have weight limit of 350 pounds. These vehicles are only designed for one person. NOTE: Wheelchair and ECV rental at any of the parks is not guaranteed. During busy times they can run out. You may not get one when park-hopping to a second park. Be aware that they will take your name, and contact you by cell phone when one becomes available. Wheelchairs and ECVs are not transferable from park to park. You can only use them in the park where they are rented. The rental is good for that entire day. TIP: If you plan on park-hopping during the same day, retain your rental receipt when you return the chair or ECV when exiting the park. At the next park, present your receipt for a chair or ECV at that park (if available). At Disney Springs Sundries (near the Coca Cola Store) – ECV/wheelchair rentals. Several wheelchairs are also available for use at Typhoon Lagoon and Blizzard Beach Guest Relations (you must leave your valid ID as your “deposit”). You can, of course, bring your own wheelchairs and ECVs, but neither water park actually rents them. The water parks may also have a water wheelchair available for you. Inquire at Guest Relations. How much does it cost to rent a wheelchair or ECV from Walt Disney World? — Wheelchairs are $12.00 per day in all four theme parks. Disney also has a Length of Stay rental ticket. With the Length of Stay rental, you make a one-time payment for as many days of rental that you will need. Upon visiting a theme park, show your receipt at the wheelchair rental location and you will be directed through the queue with little or no wait. The Length of Stay rental ticket is $10/day. The Length of Stay option is NOT offered during peak attendance times, however, such as Christmas. — Wheelchairs are $12.00 per day at Disney Springs with a $100.00 refundable deposit when the wheelchair is returned. — ECVs (Scooters) are $50.00 per day at Disney Springs with a $100.00 refundable deposit when the ECV is returned. You must be 18 years old or older to rent ECVs. Can I rent wheelchairs/ECVs anywhere else on Disney property? Buena Vista Scooters (which is an AllEars.Net Sponsor and a featured Disney vendor) is located in front of the BoardWalk Inn and Villas. ECV (Scooter) costs range from $20.00 to $40.00 per day depending on which type of EVC you desire. Weekly rental discounts are offered. Check with your vendor. Walt Disney World Swan and Dolphin. Contact the Swan and Dolphin Concierge staff in person to arrange ECV/wheelchair rental through a third-party vendor. The Concierge Staff will not order wheelchairs/ECVs for guests over the telephone. I’m using an ECV for the first time. Any advance planning I can do to make the trip easier? Any strange pitfalls I should be aware of? #1) PRACTICE. Check your area for places that have rental scooters (malls, large grocery stores, medical supply rental companies). If a friend has one, borrow it and ask for their tips. Practice backing up, turning sharp corners, and parallel parking. Especially helpful is learning how to deal with swinging doors (ram them – gently, of course! ), an elevator (drive in, back out) and a table (pull alongside, release the seat lock and turn it to face the table). #2) LEARN HOW TO BACK UP. It is an invaluable skill for getting onto a ramp or into a parking space. – It will save your battery charge. – It will keep you from going *flying* if somebody accidentally touches the “gas”. Scooter controls are on the handlebars. You may find yourself zooming forward (or *backward*, which is worse!) if someone – and it doesn’t have to be the driver – touches the control. #4) BRING YOUR OWN KEYRING. Try a plastic coil-type wrist band with a large cartoon character on it. Slip it over your wrist whenever you leave the scooter. It helps you keep track of the key, and it makes it easier to find the key if you set it down. If you don’t usually have wheels, you may feel uneasy about using a scooter or chair. You may imagine that people think you are faking an illness or injury — especially if you “look OK” and are able to leave your chair or scooter and walk around. You may want to prepare an answer “just in case”. You alone must decide what information you want to share. Be realistic. Even if you feel pretty good, you may not be able to handle the physical demands of a day at a theme park. Remind yourself that you can do a certain amount on your own two feet, or you can do a whole lot *more* if you use the wheels. Don’t let pride wear you out. #6) MENTION THE SCOOTER/CHAIR WHEN YOU MAKE HOTEL RESERVATIONS. Even if you don’t need an accessible *room*, be sure to mention that you will have a scooter or wheelchair – and specify *which*, to avoid being assigned a room in a place that doesn’t have an elevator, or a room where you can’t get a scooter through the door. #7) A WELL-PLACED TOWEL IS A DEFINITE MUST. Remember to bring a towel or other absorbent material for the seat and/or seatback for comfort. Is it a real inconvenience to ride around in a wheelchair or scooter all day? Is it realistic to plan WDW as our big vacation? It is much more *convenient* than an inconvenience! If you go at a busy time, it is a pain to maneuver in the crowds. If you are traveling alone, it can be a bother to deal with doors and counter service restaurants, etc. But yes, it *is* realistic to plan a WDW trip on wheels. You may have to plan on going slower and doing less. You may have longer waits for accessible transportation. Know your physical capabilities and limitations, study the layout of the parks, become familiar with the attractions and decide what you want to see and do, and then *go*! What happens if your ECV battery dies? Will WDW recharge your personal scooter for free? Can you get your scooter recharged other places too? Did you ever try to recharge while eating? How long does the battery hold a charge? Should we plan to stop a couple of times during the day for recharging? Doesn’t recharging take a long time? A lot depends on the size and type of scooter, and how fast you drive. WDW scooters are large, 4-wheeled machines, and they seem to run all day with no problem (remember, they only operate at slow speed). Small, 3-wheeled types that can be taken apart and stowed in a car trunk seem to last about six hours when fully charged. Remembering to take the key out whenever you stop, and driving slowly will stretch your “mileage”. If your battery on a rental dies and you are unable to recharge it, contact your vendor. They should be able to get to you and replace the scooter quickly. There is a charge indicator gauge on the controls, and when it gets into the “yellow” zone and starts to run slower you need to start thinking about plugging in. Overnight (4-6 hours) will fully recharge the batteries. As little as a half-hour will get you back on the road. If you need to take a break during the day, just plug it in then and you’ll both be ready to go later on. If you’re able to be out and about all day long, plan to park your buggy someplace near an outlet while you are at a meal or show. We will have a minivan. Is a scooter difficult for a single (non-disabled) adult to maneuver in and out of the van? Difficult, but not impossible. You can disassemble the scooter and lift the pieces in one by one. The seat comes off, the steering mechanism folds down, the two batteries come off, and on some models the chassis can be separated into two parts. Each piece can weigh around 20-35 lbs. It may not be easy, but it is possible. You can lift the whole thing into the back of the van – though this might take two strong people. Cast members will place a ramp on the accessible car of the monorail, but it is narrow, just barely wide enough for a scooter. Backing off the ramp in a scooter may be a challenge. Practice backing up in a straight line, drive slow, and let people help “spot” for you. Do you suggest taking a rental with you to the parks, or do you rent from WDW? If you are going to park-hop, consider taking your own since the parks can run out of rental units early in the day. Sometimes the hassle of transporting a scooter might seem too much, so you might want to rent one at the park. How do you deal with parking lot trams (TTC, Epcot, Studios…) when you arrive by car? If you are renting a car, and have a handicap hang-tag (placard) for your car at home, bring it with you to WDW, and use it in your rental car. That will allow you to park in the handicapped section of the parking lot, putting you as close to the park entrance as you’re going to get. If you park in the regular lot, you could end up being a *long* way from where the trams stop. WITH your own wheelchair, if you can step onto the tram, just fold up your chair and board with everybody else. It’s no worse than a stroller. WITHOUT your own chair, tell the Parking Lot cast members that you need to be on the end of the row near a tram stop, and *why*. Of course, if you have an ECV, just drive, and you can take a regular wheelchair on any monorail or bus (and most boats). What if your wheelchair is taken or moved while you are riding an attraction? Any good anti-theft meaures? Cast members sometimes move chairs and strollers while you are on the ride. Simply ask where it was moved to. You may want to hang something noticeable and unappealing on the chair. That way someone is less likely to make the honest mistake of grabbing the wrong one – and might just think for that split second before making the dishonest mistake. Note this information is subject to change without notice. Call WDW directly or visit their web pages to confirm before your visit.